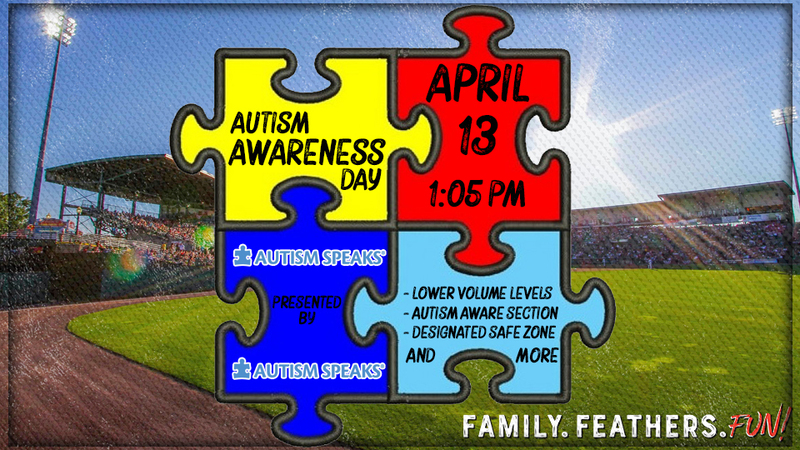 The Rochester Red Wings have partnered with Autism Speaks for a second year in a row to host Autism Awareness Day at Frontier Field on Saturday, April 13 when the Wings host the Lehigh Valley IronPigs at 1:05 p.m. The Red Wings and Autism Speaks aim to create an environment that will allow families dealing with Autism to enjoy a day at Frontier Field while also raising awareness for Autism, a disorder that affects one in 59 American children. "Every April Autism Speaks celebrates World Autism Month with autism-friendly events and educational activities around the local community to increase understanding and acceptance and foster support. Autism Speaks has partnered up with the Rochester Red Wings for a second year in hosting an Autism Awareness Day. I hope you will join us for the game on Saturday, April 13 to help us go blue for Autism during the month of April." Mike Ewing at (585) 454-1001 ext. 3036 or MEwing@RedWingsBaseball.com.